117 complaints of verbal or physical abuse against Muslims were made between September 15 and October 15. 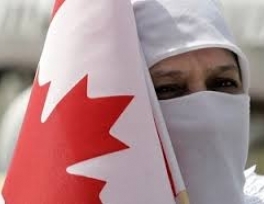 Islamophobic abuse has soared in the Canadian province of Quebec since the government proposed a ban on religious symbols for public workers, a survey shows. The Collectif Québécois contre l’islamophobie, a local anti-Islamophobia group, said on Tuesday that 117 complaints of verbal or physical abuse against Muslims were made between September 15 and October 15. This can be compared to a total of 25 complaints made in the first seven months of this year or 3.5 complaints per month on average. The group’s spokesman, Adil Charkaoui, said Muslim women were overrepresented in the study as they accounted for 114 of the 117 complaints. According to Salam Elmenyawi, president of the Muslim Council of Montreal, the spike in attacks is a consequence of the debate over the Parti Québécois government’s proposed Charter of Values. The charter will ban all public workers from wearing visible religious symbols such as the hijab, kippa, turbans and larger-than-average sized crucifixes in the workplace. “Premier (Pauline) Marois’ introduction of the Charter of Values has unleashed an alarming number of xenophobic and Islamophobic attacks,” said Elmenyawi. He added that he would request a meeting with Montreal mayor-elect Denis Coderre to discuss the situation and the need for Quebec police to take verbal assaults on Muslims seriously. Such incidents have led to high stress levels among the Muslim community, said Bouazza Mache from market research firm, MarkEthnik. The research firm conducted a recent Internet poll, which showed that 85 percent of Muslims found the current social atmosphere in Quebec either tense or very tense. The Quebec Human Rights Commission has censured the planned charter, saying the ruling party’s proposal is a clear violation of personal freedoms guaranteed under the province’s own charter of rights, the Canadian Charter of Rights and Freedoms, as well as the international law.